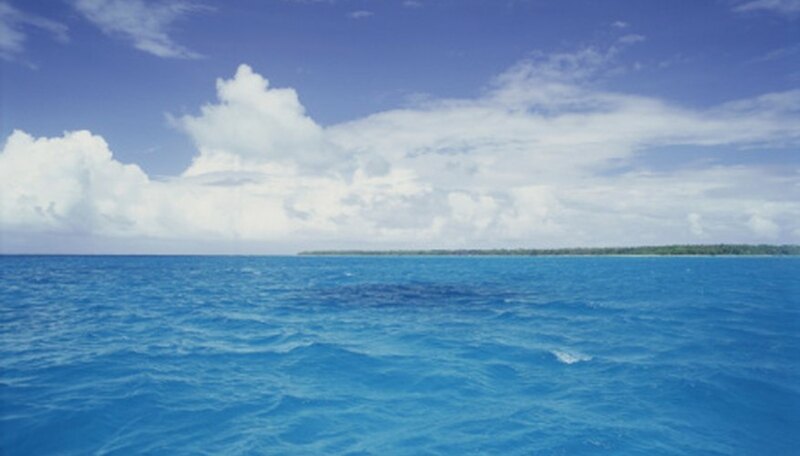 When drawing the ocean, remember that this large body of water displays numerous shades of blue. From bright aqua to rich purple, the ocean ranges from pure blue to green tints. To form your ocean, keep colors near the horizon line lightest, because this effect gives the illusion of distance. Make sure to keep your pencil strokes smooth and fluid to capture the liquid texture of water. Avoid making patterns or leaving portions of the page visible in between colored pencil lines. Draw a horizontal line across the page to represent the horizon. Color the entire area below the horizon line in aqua colored pencil, leaving a few long horizontal spaces blank. You will use these blank spaces later to suggest the white caps of waves. Apply pressure to your pencil to achieve intense, smooth coloration. Make long streaks of purple in the bottom half of the aqua colored region. Make these streaks broad and thick. Shade darkly to achieve a smooth texture. Color over the edges of the purple regions with the blue colored pencil. Shade over large regions of the bottom half of the aqua section with the blue colored pencil. Add long, thin streaks of blue to the top half of the aqua region. Color the blank regions with white colored pencil. Color over the edges of these blank streaks with white to lighten the surrounding colors. Apply pressure to the pencil for intense color. Apply white colored pencil to the top one third of the aqua region to lighten it. Extend the white into the remainder of the ocean colors, using long, widely spaced steaks of white. Keep the horizon line smooth and clean, and avoid creating a jagged or rough edge with your pencil strokes. Based in Nashville, Deborah Walden has been writing professionally since 1997, starting as a sports writer for her college newspaper. Her articles have appeared in "Nashville Arts Magazine" and "The Nashville Scene," among other publications. Walden holds a Master of Arts in art history from Vanderbilt University.